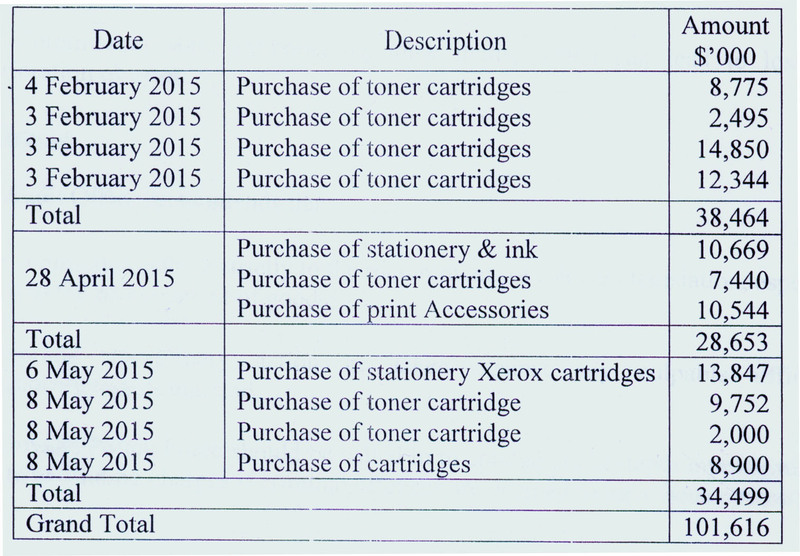 Eleven contracts worth $101.6m for ink toners and cartridges were apparently split by GECOM to avoid Cabinet scrutiny and awarded to the same supplier according to a special investigation by the Office of the Auditor General, which also cited instances where the items appeared not to have been needed and contracts being signed after the supply of goods. This report on the toners and cartridges obtained by Stabroek News will raise further questions about procurement practices at the Guyana Elections Commission (GECOM). It comes on the heels of another on radio sets which found serious breaches of procurement rules and advised that the police be called in. This report which was submitted by the Auditor General on September 29, 2017 to Chief Election Officer, Keith Lowenfield in relation to the purchase of toners in the years 2015 and 2016 also advised that the police be called in for a deeper examination and for criminal charges to be brought where necessary. GECOM has come under scrutiny over procurement but the matter has not been publicly addressed in the last two years. In his transmittal of the report to Lowenfield, Auditor General Deodat Sharma noted that the report did not include responses from GECOM as none was offered to the draft report which had been submitted by the auditors. Under Section 54 of the Procurement Act, 2003, Cabinet has the right to review all procurements exceeding $15m. 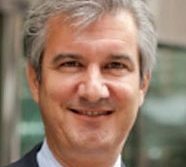 Section 14 of the Act also inveighs against contract splitting for the sole purpose of avoiding any aspect of the Act. All 11 of the contracts issued between February 4th 2015 and 8th May 2015 fell under $15m. The report did not name the supplier who benefited from the $101.6m worth of contracts. In four of the contracts totalling $38.4m for ink toners and cartridges, the restricted method of procurement was applied. In three instances, the supplier was the highest bidder. In the fourth case, the supplier was the second highest bidder. The report said that had the four contracts been awarded to the lowest bidder, GECOM would have saved $18.9m. Six contracts amounting to $54.8m were awarded on the basis of an apparent need which may not have necessarily been the case. “Moreover, it was found that the items acquired from these contracts were not issued with any urgency as would have bene indicated by the basis of the award”, the report said. The supplier failed to meet his commitments as it related to the delivery of goods on four contracts worth $25.4m. Even though the contracts provided for the instituting of a penalty for later delivery GECOM did not apply this. The penalty amounted to around $2.3m. The report also found that GECOM was overstocking some of the items. In relation to a contract of $8.775m for the purchase of 450 and 300 Canon PG 140 and CL 141 ink toners respectively, the report found among other things that the items were delivered on the same day that the contract was signed. Another contract awarded by the National Procurement and Tender Administration Board for $7.439m for 100 B-126X black toners saw the toners being delivered on 30th April 2015 although the contract was signed on May 6th 2015. A contract for $8.9m for 100 Xerox print cartridges saw GECOM receiving the goods on April 20th, one month and two weeks prior to the signing and award of the contract. The report said “This exemplified that the Commission was seeking post approval for the acquisition of the toners”. In another case, a contract was awarded in the sum of $9,752m for the purchase of 756 Canon PG-40 black cartridges. The contract was signed on May 21, 2015 and the commission received the 756 cartridges on May 8th 2015, 13 days prior to the signing of the contract. It was recommended in the report that GECOM “adhere strictly to the requirements of the relevant legislation, especially as it relates to the procurement of goods”. It was further recommended that appropriate disciplinary charges be taken against any culpable officer and that the police be called in. 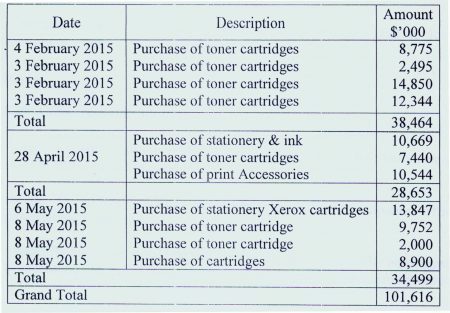 The toner probe was launched after discrepancies were observed in August 2016 by an audit office team doing the annual audit of the 2015 accounts of GECOM.